Archive by category "Pain Management"
If you are constantly bloated seemingly no matter what you eat, and have gas pain and discomfort, this post is for you! As I child I suffered from chronic stomach pains. After enduring a bunch of medical tests in my teen years, I was finally diagnosed with IBS and was told by my Doctor to avoid caffeine, spicy foods, fried foods, chocolate and popcorn. Giving up these foods – I did so for about a month – didn’t help at all and if you read on, you’ll see why. If you don’t know what IBS is, it stands for “Irritable Bowel Syndrome” and in the medical world basically means “we can’t find anything seriously wrong with you, but your intestines are irritated for some reason – possibly stress and anxiety and too much spicy food – and we have no way to fix it other than to offer meds that may or may not help, but in all likelihood will make your symptoms worse in the long run.” OK, fine maybe that’s not exactly what it means, but you get the point. All joking aside, IBS is diagnosed when other serious gastrointestinal diseases such as celiac, bowel cancer, chron’s disease and also some gynecological conditions are ruled out. Well, as it turns out, the folks at Monash University have been researching this a long time and several years ago came out with a program that really, REALLY helps people with IBS. It’s quite remarkable how much better you can feel while following this simple program – you will notice a change within the first WEEK! Even if you haven’t officially been diagnosed with IBS, if you have the symptoms mentioned above and have ruled out other issues, this program may help and is certainly worth a try. 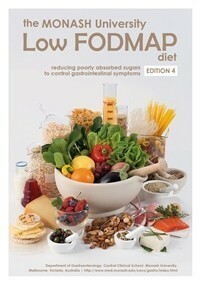 The program I am referring to is known as the Low-FODMAP diet. FODMAP stands for Fermentable Olig-saccharides, Di-saccharides, Mono-saccharides and Polyols. These sugars can be poorly absorbed in the small intestine and fermented by bacteria to produce gas. Current research strongly suggests that this group of sugars contributes to IBS symptoms. Bacterial Overgrowth in the Small Intestine – In some individuals, some of the bacteria that are normally located in the large intestine, move up in to the small intestine which creates the symptoms of IBS. Note that not all individuals diagnosed with IBS react to ALL of the different types of FODMAPs. Some of the FODMAPs ie. fructose, lactose and sorbitol, can be tested using a special breath test that can determine malabsorption but others cannot be tested and should simply be avoided to help relieve symptoms. (Ask me about this test if you suffer from IBS and don’t want to unnecessarily avoid foods from this program). * Note: For many people, onions and onion powder cause the MOST painful symptoms. While this is hard to avoid when eating out, it is very easy to replace with green onions or chives in any recipe calling for onions. There is also an Indian spice called Asafateda powder that may be used and is said to have a strong onion/garlic flavor, but I have not personally tried it. For details on the quanities of the foods to be limited, as well as other foods that may or may not be a problem in your particular case, you can purchase the official Monash University Low Fodmap diet booklet HERE or by clicking on the picture above. For breath testing, and/or to discuss your particular health challenges and food sensistivies that may also play a role in IBS, Book an Appointment and I will be happy to help you. We know vegetables are part of a healthy diet, but what about nightshade vegetables? And what the heck are nightshades anyway? So what is it about Nightshades that make them potentially problematic? Plants produce alkaloids primarily designed to help protect them from insects. The active alkaloid in nightshades, is a drug-like alkaloid that may compromise function in the bodies of sensitive individuals. There is no solid research evidence showing an impact on the nervous system or joints, but it there are many people, especially those with joint pain, but also many with digestive complaints as well as nervous system disorders, who feel a lot better when nightshades are eliminated from their diet, as it seems to relieve a variety of conditions. Some researchers believe that arthritis is often misdiagnosed in people who may in fact only be experiencing the effects of nightshade consumption; in fact, one in three arthritics will react badly to nightshades. Though not yet understood how, nightshade foods may remove calcium from bones and deposit it in soft tissue, setting the stage for arthritis. For this reason, researchers have recommended that all individuals with osteoarthritis, rheumatoid arthritis or other joint problems like gout eliminate nightshade foods from their diet. As a young child I had psoriasis on one of my knees. If you aren’t familiar with psoriasis, it is an autoimmune skin disorder that sort of looks like eczema but generally occurs on the outer elbows and knees (although it can occur anywhere on the body) as opposed to the inner elbows and knees as typically characterized by eczema. There are many different types of psoriasis, but the common type has clearly defined borders and the skin flakes in round white patches, which causes it to itch – a lot. Sounds delightful, I know. 🙄 It is notoriously difficult to treat, but a healthy diet and a well functioning digestive system is of utmost importance; I believe it is for this reason that mine cleared up almost 20 years ago when I began my journey towards living a healthier lifestyle. Unfortunately, about a year ago I was hospitalized for a few days with a severe bacterial infection in my leg (that’s what happens when you scratch a cut on your leg with not-so-clean-hands, folks ops: ) and was given massive doses of antibiotics; not surprisingly, since antibiotics destroy the balance of gut flora, especially at those high doses, the psoriasis returned. Since many experts believe that Nightshades should be avoided not only by those with joint pain and problems, but by people with autoimmune disorders in general, I decided to give it a shot and gave up ALL nightshades for 3 months. Want to know what that’s like? Well, never mind the fact that I LOVE eggplant and tomatoes/tomato sauce but eating at a restaurant or at a friends house became almost impossible. Restaurants love using Paprika on EVERYTHING – and friends just thought I was more nuts than usual as I picked the peppers and tomatoes out of their salads. I stuck with it, though, because I had to see for myself if this was a contributor to the problem. After the 3 months although there wasn’t much of an improvement in my skin condition, I did learn that high amounts of nightshades, tomatos in particular, did make the itching worse. If you have any of the issues above, especially joint pain, arthritis, rheumatoid arthritis or other autoimmune disorder, eliminate nightshades from your diet for 3 months to see if it makes a difference. Less than 3 months just isn’t enough to really come to a good conclusion, although if you are sensitive to them you should feel some improvement right away. If it doesn’t make any difference at all, enjoy. If it makes somewhat of a difference, than have them in moderation, cooked, for this lowers the alkaloid content by 40-50%. If you have noticeable improvement in your symptoms, then obviously stay away! Have you tried avoiding Nightshades and did it help you? UPDATE JULY/2014: I recently had a skin biopsy and, as it turns out, I was mis-diagnosed as a child and never had psoriasis. What I have, in fact, is eczema. While health experts believe that it the same leaky gut that contributes to both psoriasis and eczema, there are other differences pertaining to these conditions and it may explain why avoiding nightshades did not work for me. A few years ago, after many months of intense exercise, I developed a serious back and neck pain problem. At first I wanted to blame the program I was doing, which was P90X, the famous Beachbody Home Fitness program that I loved, but I soon started to realize that the issue was a lot more complex than that. At 5’10” I unfortunately had years of poor posture, including making the common mistake of overworking the muscles in the front of my body ie. chest, abs, quads, and not focusing nearly enough on the muscles in the back of my body including upper back, glutes and hamstrings. This is a common cause of creating an imbalance in the muscles, with the body constantly trying to re-align itself to better posture, while fighting against the contracted muscles of the front of the body. It seems really simple to understand but I, like most people, tend to enjoy working more of what we can actually see in the mirror and I was guilty of not looking at my body objectively the way I always do when I train a client. Because of this imbalance, my lower and middle back, as well as my neck*, hurt constantly. To make matters worse, I was told after an MRI that the pain was not caused by a muscular imbalance, but rather by herniated discs and arthritis. It’s too long to explain here why I later came to the conclusion that this idea is not valid, but you can learn more by reading Healing Back Pain: The Mind-Body Connection, by Dr. Sarno. (At first, I was completely opposed to the ideas in this book, but the more I read, the more I was convinced at the validity of the content). Anyhow, after the MRI, it was recommended that I go to physiotherapy and stop exercising; I was also told I would probably never be able to workout that intensely again, which caused a great deal of psychological stress and worry (again, see Dr. Sarno’s book, above, which explains how this creates a cycle of increasingly more pain). I ended up going to numerous physiotherapists and chiropractors, as well as specialists in acupuncture and nothing, I mean NOTHING helped – in many cases I just felt worse, with pain that extended into my head, behind my eyes, down my left arm and into my knees – even into my right foot. At this point I was really frightened and depressed so I contemplated paying thousands of dollars for spinal decompression, which may work for some people but (a) I couldn’t afford it and (b) frankly it scared the hell out of me after reading some patient reviews. I also want to note that, as a Holistic Nutritionist, I was taking all the “right” supplements such as Curcumin, EFA’s and following an anti-inflammatory diet, but it simply wasn’t enough to correct the problem. Although they certainly helped decrease my level of pain and I would recommend it, when the cause of the problem is structural, those imbalances must be corrected. Unfortunately, the particular “specialists” I went to were as clueless as I was and gave me ineffective treatments and exercises that only made the issue worse. It hurts like hell! No really, it does. I’m pretty sure I cried the first time and cursed out Dr. Nick like a trucker. Apparently this is not an uncommon reaction since he merely smiled and continued torturing me. Obviously, it was well worth it, because after a few sessions, along with the back pain home exercise program he helped to create called the FPR Program, I was finally pain free. You can’t imagine the relief I felt at knowing that I could continue to do the things I love, with only a few minor modifications to prevent that type of pain again. The knowledge I gained regarding muscular imbalance was invaluable as well and has helped me work with my clients more effectively. So what is the FPR Program? FPR – or the “Feeling Pretty Remarkable” Program, is a series of straightforward, easy to follow exercise programs created by leading medical professionals that you can do in the privacy of your own home for 15 minutes a day. It does not require fancy equipment or a lot of space; they were to designed to be simple and effective by re-training the muscles of the body that are out of balance and, in turn, make you pain-free. There are 4 levels t each program, so you start off easy and progress every 3 weeks over a 12 week period, at which point you will be amazed at how much better your back feels. The FPR knee pain relief program is equally as effective if your pain is focused in or around your knee joint. Please note that I would never endorse these products if I didn’t use them myself and recommend them to many of my clients, all of whom have experienced excellent results. I’m happy to report that, even after several years, I am still able to do high intensity exercise programs and I am mostly pain-free, except when I overwork certain muscle groups. When this happens, I simply take a break for a few days, and do the exercises I learned in the FPR programs. Occasionally, I will re-visit my chiropractor and have some torture – I mean, active release technique – done on me in order to maintain my active lifestyle. To purchase the FPR Back Program, click HERE. To purchase the FPR Knee Program, click HERE. If you have any questions regarding either of the above programs, please ask in the comments below and I will be happy to help you as best as I can. *Although the low back pain program was not specifically designed for neck pain, in my particular case it helped for neck pain as well as low back pain. Please consult with your Doctor, Chiropractor or other specialist if you have neck pain before doing the FPR low-back program.